For other uses, see Room (disambiguation). "Rooms" redirects here. For the cultural facility, see The Rooms. In a building, a room is any space enclosed within four walls to which entry is possible only by a door that connects it either to a passageway, to another room, or to the outdoors, that is large enough for several persons to move about, and whose size, fixtures, furnishings, and sometimes placement within the building support the activity to be conducted in it. Historically, the use of rooms dates at least to early Minoan cultures about 2200 BC, where excavations at Akrotiri on Santorini reveal clearly defined rooms within certain structures. In early structures, the different room types could be identified to include bedrooms, kitchens, bathing rooms, reception rooms, and other specialized uses. The aforementioned Akrotiri excavations reveal rooms sometimes built above other rooms connected by staircases, bathrooms with alabaster appliances such as washbasins, bathing tubs, and toilets, all connected to an elaborate twin plumbing systems of ceramic pipes for cold and hot water separately. Ancient Rome manifested very complex building forms with a variety of room types, including some of the earliest examples of rooms for indoor bathing. The Anasazi civilization also had an early complex development of room structures, probably the oldest in North America, while the Maya of Central America had very advanced room configurations as early as several hundred AD. By at least the early Han Dynasty in China (e.g. approximately 200 BC)[disputed – discuss], comfort room complex multi-level building forms emerged, particularly for religious and public purposes; these designs featured many roomed structures and included vertical connections of rooms. Some rooms were specially designed to support the work of the household, such as kitchens, pantries, and root cellars, all of which were intended for the preparation and storage of food. A home office or study may be used for household paperwork or external business purposes. Some work rooms are designated by the intended activity: for example, a sewing room is used for sewing, and the laundry room is used for washing and ironing laundry. Other rooms are meant to promote comfort and cleanliness, such as the toilet and bathroom, which may be combined or which may be in separate rooms. The public equivalent is the restroom, which usually features a toilet and handwashing facilities, but not usually a shower or a bathtub. In the 17th, 18th, and 19th centuries, among those who could afford it, these facilities were kept in separate areas. The kitchen was detached from the main part of the house, or later put in the basement, to reduce the risk of fire and keep the heat and smell of cooking away from the main house during the warm months. The toilet, often a simple pit latrine, was put in an outhouse or privy, to keep the smell and insects away from the main house. A variety of room types have been distinguished over time whose main purpose was socializing with other people. In previous centuries, very large homes often featured a great hall. This room was so named because it was very large, regardless of any excellence in it. It was originally a public room and most likely seen in the main home of a noble estate. In this room, people who had business with the local landowner or his household could meet. 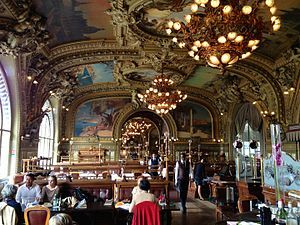 As the largest room, it could also be used as a dining room for large banquets, or cleared of tables, provided with music, and turned into a ballroom. Off the side, or in a different part of the house, might be a drawing room, used as a room with greater privacy, for the owner's family and their friends to talk. A sitting room, living room, or parlour is a place for social visits and entertainment. One decorated to appeal to a man might be called a man cave; in an older style, the cabinet was used by men who wanted a separate room. Some large homes have special rooms for entertainment; these may include a library, a home theater, a billiard room, a game room, or a music room. A bedroom is the room where a bed is located, and whose primary purpose is sleeping. A master bedroom may have an en suite bathroom. 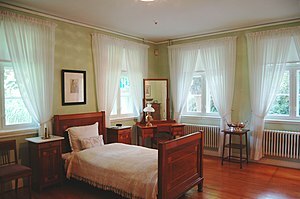 A guest room is a bedroom used primarily by overnight guests. The nursery is a bedroom for babies or young children. It may be separate from the playroom, which is a room where the children's toys are kept. Bedrooms may be used for other purposes. 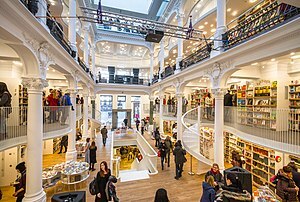 A large house might have separate rooms for these other functions, such as a dressing room for changing clothes (also seen in clothing stores and businesses where people need to change clothes, but do not need to sleep). In Tudor times, a bedroom might have a separate closet, for praying and seeking privacy; this architectural idea lives on in the storage closet. In the United Kingdom, many houses are built to contain a box-room (box room or boxroom) that is easily identifiable, being smaller than the others. The small size of these rooms limits their use, and they tend to be used as a small single bedroom, small child's bedroom, or as a storage room. Other box rooms may house a live-in domestic worker. Traditionally, and often seen in country houses and larger suburban houses up until the 1930s in Britain, the box room was for the storage of boxes, trunks, portmanteaux, and the like, rather than for bedroom use. A sick room is specialized room, sometimes just large enough to contain a bed, where a family member could be conveniently tended and kept separate from the rest of the household while recuperating from an illness. 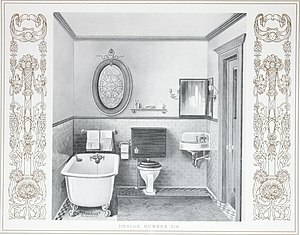 In smaller homes, most rooms were multi-purpose. In a bedsit, communal apartment, or studio apartment, a single main room may serve most functions, except usually the toilet and bath. Types of multi-purpose rooms include the great room, which removes most walls and doors between the kitchen, dining and living rooms, to create one larger, open area. In some places, a lady's boudoir was a combination sleeping room and place to entertain small numbers of friends. 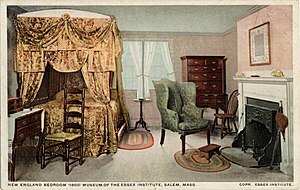 In others, the boudoir was an anteroom before her bedroom. ^ a b "Archaeological Site of Akrotiri". Travel to Santorini: Santorini Island Guide. Marinet Ltd. Retrieved 23 November 2009. ^ a b Lane, Megan (2011-04-12). "The story of our rooms". BBC News. Retrieved 2018-07-11.